Live Performance is a plural script for Danmakufu ph3. 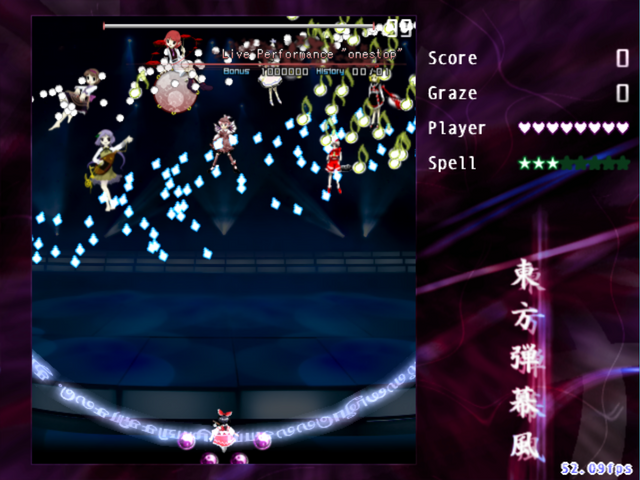 It features Mystia, Lyrica, Lunasa, Merlin, Benben, Yatsuhashi, and Raiko, who fire danmaku as they play a piece of music for you. 15 songs are included with the script, and it's very easy to add new ones. Download the full version of the script here (46.6 MB). 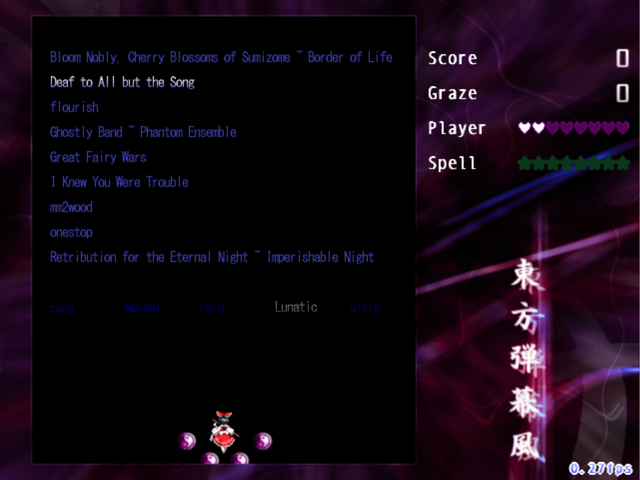 There is also a smaller version of the script here (5.1 MB) that doesn't include any songs; you'll have to add your own. To play the script, download Danmakufu ph3 and then extract the script into your Danmakufu scripts folder. Then select Live Performance from the list of Plural scripts. You can use any player script to play. To add a new song, put both a MIDI file (.mid) and an audio file (.wav, .ogg, or .mp3) of the song into the folder "Live Performance\music". Make sure the audio file and the MIDI file are synced. In rare cases, you may see the error message "This MIDI does not have Format 1". If you do, use a MIDI editor to convert the MIDI to Format 1. Here is the list of songs included in the full version of the script. Please read the CREDITS.txt file for the full credits. i just tried converting my midi to format 1 using sweet midi converter. but if i play the script. the danmakufu crashes. It's a really interesting concept and I feel that although it's hard to generate 'good' danmaku, what you've done is pretty impressive. Interesting concept, pretty good execution, and surprisingly well-done support for adding new MIDI tracks. Thanks Sparen! I'm glad you enjoyed the concept. 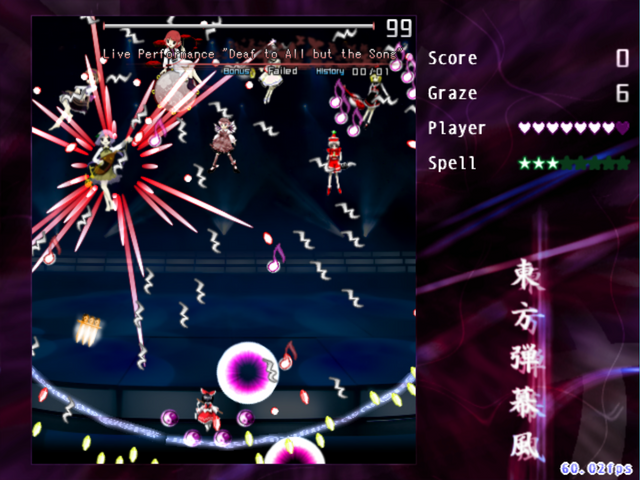 I'm considering modifying the script to use MIDI CC's to finely control the danmaku and the characters that appear. Perhaps that would make the dodging less "random", assuming that you use a MIDI specifically created for the script. kanakojarasu, do you mind sending me the MIDI and audio file you used so I can debug? When making a post, there is an option for "Attachments and other options" where you write your post. You can attach the files you used here so that the creator of the script can try them out themself. You probably can't add attachments below 10 posts. You can use a service like Mega to upload files.